A marketing plan should promote saleable goods. Flyers glued on every post or a free sample is a start, but you’ll need to do more than that to relay the information about your new flavor of ice cream and get the word out to your target demographic. Offer free samples for passersby to attract potential future customers. Provide a short description of your new flavor that is catchy and easy for the public to remember. Create a uniform description for all employees to use so they can effectively and briefly explain the new flavor available. In this way, you create a strong advertisement that will not cause buyers to confuse a different but similar name or flavor with your new ice cream offering. Make a marketing plan. Decide if you’d like to market on the streets, going around your local community offering neighbors tastes of your new-flavored ice cream. Try to incorporate both ideas into your plan. Come up with a catchy phrase describing the ice cream’s flavor. Spread the word to your family and friends so they all use the same descriptors. Make the description brief to keep the attention of the people. You don’t want the description hard to get and remember but be sure you do get your point across and make a connection. Social networking sites can help you introduce the new ice cream flavor thanks to the vast number of members logging every day. The most popular options are, of course, Facebook and Twitter—both of which offer free accounts and user-friendly sites. Update your status once in a while, featuring the endorsement of the new ice cream flavor of your company. Encourage users to “like” the status in exchange for a coupon or discount code for a free scoop. Interactions with readers will entice them to try your new product. Make sure also that when you update your status the phrases or words drawing in clients come across do the job of promoting your business and new flavor. This social media idea will aid you in calculating how many people your ads are reaching. Choose a day with pleasant weather on which to bring your new flavor and disposable spoons for taste testing. You can start within your village and slowly reach out to your neighboring streets and towns. Ensure you use a clean utensil when offering the ice cream to potential customers Don’t forget to bring flyers, postcards and other promotional items with a clear presentation of the description of the new flavor; name and address of the ice cream shop; opening and closing times; the telephone number; and a list of the many flavors you offer. Be sure to check all food safety laws according to your state. 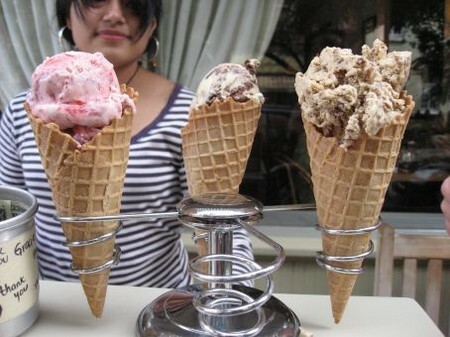 Learn the proper way how to maintain the ice cream at the proper cold temperature. This is done to ensure the ice cream when promoting on the streets. Always have your marketing team use gloves and clean utensils when offering free samples.